A practical guide für a journey to Naples. What you should know, when you visit the bay of Naples and the Amalfi Coast. All important Traveller information for tourists. Find out everything about travel, public transport in Naples, booking of accommodation, weather in Campania, highlights and sights, excursions to the Amalfi coast and Sorrento, ferries, tips for cruise. Useful Traveller information for your travel and stay in Naples and ist surroundings. How can you arrive to Naples and Campania? By airplane to Napoli-Capodichino airport (NAP), train, bus or car. How to get to Naples from Capodichino airport? The airport Napoli-Capodichino (NAP) is located seven Kilometers from the Centre of Naples. From the airport, buses or taxis drive in about 20 minutes to the city centre. Bus stops right in front of the Terminal. There is an airport bus (“Alibus”). At the airport, there is no metro stop and no train station. ANM-bus: Direction: Piazza Garibaldi (work. ), line 3S, departure every 10 minutes or Alibus shuttle bus: 6.30 clock 23:30, departure every 30 minutes. How do I get from Naples to Pompeii, Herculaneum and Sorrento? Take the regional train CIRCUMVESUVIANA, which departs in the basement of the central station in Piazza Garibaldi. Pompeii takes about 40 minutes, Herculaneum about 35 minutes and Sorrento (last stop) one hour from Naples. How is the weather in the Gulf of Naples? Pleasantly Mediterranean. Also in the summer, always a pleasant breeze blowing in the port city and the average temperatures are between 25 and 31 degrees. In the winter, the temperatures are between 4 and 11 degrees. The sea has pleasant temperatures from mid-June to September. What are the highlights in Naples and the most important attractions? What are the most popular events in Naples? Particularly interesting are the cultural event May of monuments, the feast to the blood miracle of St. Januarius and the event Pizza Village. There are beaches in Naples city? Yes, but in the Centre only some small. There are the most beautiful sandy beaches in Posillipo, a suburb of Naples. Larger sandy beaches on the Mainland are in Meta di Sorrento on the Sorrento Coast. Also on the Monte di Procida at Pozzuoli (in the vicinity of Naples) and of course on the islands Ischia and Procida you can swim. Ischia has very long beautiful sand beaches, Capri only some small bays. What shore excursions can I do during a cruise to Naples? For exploring a city on your own and without an organized excursion, Naples is exactly right. Many interesting sights can be reached from the Harbour on foot and a shore excursion in Naples is easy to organize. Book shore excursion and tours from Naples to Amalfi Coast, Sorrento, Capri or the histric centre of Naples online. Where I spend the night in Naples? Small bed & breakfast, where the owner likes to offer advice and tips are especially favorable and characteristic. Who’d rather stayed in a hotel, has a great selection in all price ranges in Naples. There are also apartments where you can stay for a short time (often with a minimum stay of three days). The most exclusive hotels are located at the Via Partenope (promenade). There is also a wide selection of cheap Hostels. Where can I book tours and excursions for Italy, Naples, Sorrento and Amalfi Coast? Where can I book a ferry to the islands Ischia, Capri and Procida and Amalfi Coast? You can buy the tickets directly at the harbour Molo Beverello in Naples. Alternatively you can order a ticket online (also information about time table). 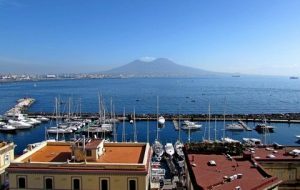 What should I know about ferry transport in Naples? Can I buy tickets online for the excavations of Pompeii and museums? Yes, it’s possible to purchase tickets for Pompeii online and to skip the line at the entrance. Here is a selection possibilities. You can choose to buy online the entrance ticket or to purchase a guided tour.